Update: November 2018 - this way of manual balancing for Cypress tests is obsolete. There is a much faster and simpler way to run multiple specs in parallel using Cypress parallelization flag. See Run and group tests the way you want to. This will be useful to anyone who is using Cypress, and possibly is looking to run the tests on the private hardware, instead of the cloud solution from the Cypress team. Imagine a small test spec file to be executed by Cypress. It opens a page and confirms that the loader element is invisible. Note that the bundle only includes noLoader function from src/utils.js - the other functions were "shaken off" by the Rollup, since they were never imported. Even if you stop reading right now, you can benefit from using Rollup to split your testing code into simpler individual files. Rollup is great when one produces a single output bundle. We can use either CLI options or create a rollup.config.js that describes the input and output paths. But this does not scale up - we want to have multiple output spec bundles, because we do plan to run multiple Cypress instances on CI, each instance executing its own spec file. Rollup only supports a single entry, and as our tests grow we have multiple files to bundle instead. Rollem even supports watching source files for any changes, and rebuilding the bundles, shortening each "code - run - test" iteration. Running Cypress on your own CI server requires preparing the environment; most importantly it requires xvfb to run. The simplest way to prepare and isolate the environment is to make a Docker image with all dependencies pre-installed. We have prepared an image and publicly released it under a personal name; the Cypress team will probably release an official image when they have some free time. The Docker file we have released uses Node 6 base image and currently includes the Cypress executable v0.16.4; the version can be easily customized via an argument. The built Docker image is hosted at the public hub, and is built automatically using the Automated build feature. Every time we push a commit to the GitHub repo bahmutov/cypress-image, the new Docker image is created. We plan to generate multiple test "spec" files, and then execute them using our own GitLab CI server. To isolate the individual tests, we will use Docker containers, each based on the base Cypress image. When we roll multiple separate test bundles, we also generate a single .gitlab-ci.yml file. It has a single "build" job (that uses rollem to build the bundles) and multiple "test" jobs. The "test" jobs will only execute after the successful "build" job finishes; the "test" jobs can execute in parallel. By adding more individual workers to the project, we can potentially execute all N "test" jobs in parallel on N workers, cutting the end to end testing time to 1-2 minutes. Here is a part of the typical .gitlab-ci.yml file generated by the multi-cypress tool (built on top of Rollem). The "build" step only generates the bundles spec files (and passes them to the "test" step as artifacts). All "test" jobs are kind of the same, only the spec filename differs, thus we use a special template feature in the GitLab CI file. It allows us to reuse the common test step commands without repeating same commands. - cypress ci --spec "cypress/integration/$CI_BUILD_NAME.js"
The shared GitLab runner does not reflect the accurate performance advantages; it spends 90-150 seconds per test, but about 90% of the time is spent downloading the base Cypress Docker image - the shared worker does NOT cache the bahmutov/cypress-image Docker image! On our private runners, the image is cached, thus each test job starts almost immediately, cutting the time per spec job to just a few seconds. We love using Cypress to test our web applications. 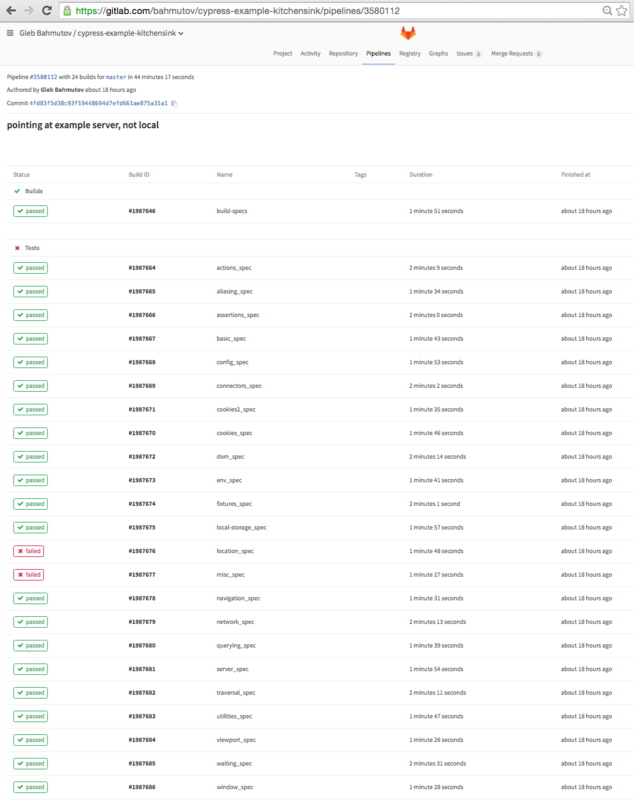 It really shines when using locally, and we have been able to develop and open source the tools listed above to allow everyone to quickly run the same tests in house. I am sure that the Cypress team will invest heavily in its own hosted CI cloud solution; but for people like us who absolutely have to run tests in house, the multi-cypress fits the bill. Hope your continuous testing solution can benefit from our tools, and if there are any questions or issues, let us know!